Many years have passed since I sat in a college classroom to learn about transistor fundamentals. The industry had long moved past germanium transistors and was solidly into silicon. 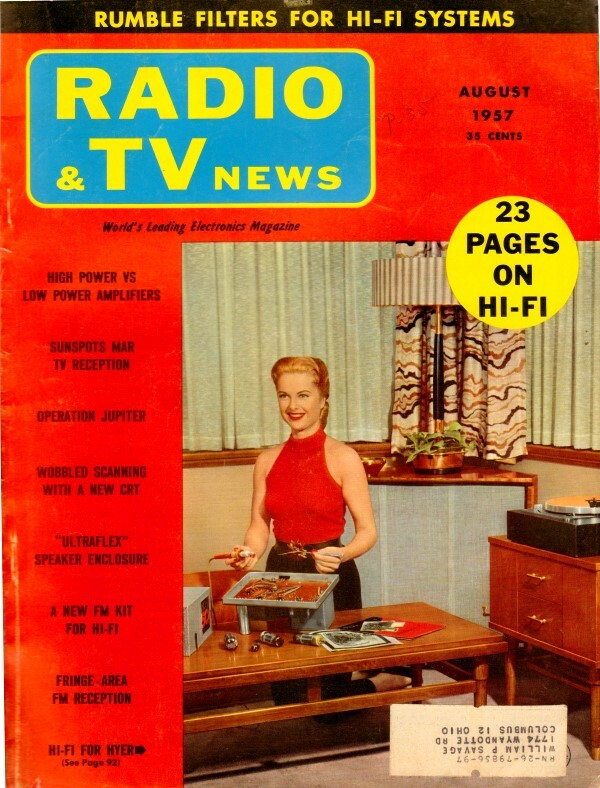 Having been formally introduced to transistors in the USAF, I was familiar with their functionality from a technician's perspective of checking for gain, proper bias (as indicated on "educated" schematics), and determining go-no-go health by performing a front-to-back resistance measurement using an ohmmeter. Holes, energy bands, gate widths, and doping levels were first encountered in solid state physics class, however. This article does a nice job of introducing the terms and concepts at a layman's level. I actually found the vacuum tube circuits in our radar unit easier to troubleshoot than transistor circuits, partially because I had a little experience with them prior to enlistment and also because the point-to-point component mounting made it easy to isolate or remove components from the rest of the circuit. It was rare to destroy a vacuum tube by shorting out or improperly installing another component in the circuit. Today's field techs typically swap out circuit board assemblies after the system's built-in-test (BIT) advises corrective action on a computer monitor. For a true understanding of semiconductors, you must be able "to speak the language". Here is how. 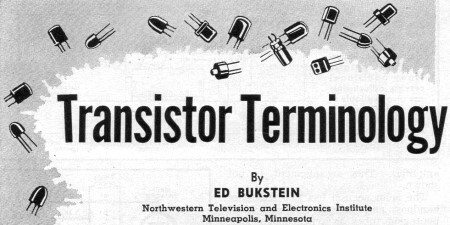 The transistor has now ceased to be an experimental device and has become, instead, a commercial reality. The technician who fails to recognize this fact and does not prepare himself accordingly, faces a future as limited as that of an automobile mechanic who does not acquaint himself with automatic transmissions. In his attempts to read up on transistors, the technician too often finds himself engulfed in a fog of unfamiliar terminology. Such terms as injected carriers, intrinsic semiconductor, trivalent impurity, etc. are from the vocabulary of the semiconductor physicist and to the average technician are as meaningless as Sanskrit. It is the purpose of this article to define, in terms familiar to the technician, the terminology of transistor physics. In some substances, the atoms are arranged in neat, orderly geometric patterns, like oranges in a newly packed crate. These are known as crystalline substances in order to distinguish them from materials in which the atoms, like grains of sand on a beach, have no regular pattern of arrangement. Because of the geometric orientation of their atoms, crystalline substances have characteristic shapes. A familiar example is the six-sided rod of quartz in its natural state. Fig. 1. Hexagonal tiles fit together perfectly. Each tile is associated with six adjacent tiles. Atoms of germanium fit together perfectly. The four outer orbit electrons of each atom are associated with outer orbit electrons of adjacent atoms. Such associations are called "valence" bonds. Fig. 2. Since boron has only three valence electrons, one of the valence bonds is left unsatisfied when an atom of boron is added to germanium. The "missing" electron creates a hole in the crystal structure. When arsenic is added to germanium, each atom contributes a surplus electron. Germanium is a crystalline substance whose electrical resistance is too great to permit ·its use as a conductor and too low to be used as an insulator. For this reason, germanium is classified as a semiconductor. 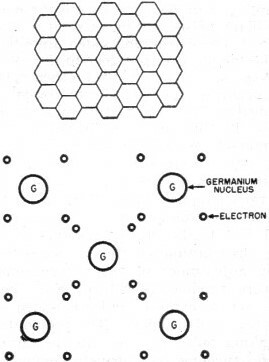 In each atom of germanium, 32 electrons revolve around the nucleus. These planet-like electrons are located in four orbits or rings. The outer orbit, known as the valence ring, contains four of the electrons. In a germanium crystal, the four valence ring electrons of each atom are associated with the valence ring electrons of adjacent atoms. These associations or partnerships of outer orbit electrons are known as valence bonds or covalent bonds. To illustrate the concept of valence bonds with a purely mechanical analogy, consider a floor made up of hexagonal tiles as shown in Fig. 1. It is apparent that tiles of this particular shape will fit together perfectly, and that each tile is associated with six adjacent tiles. An analogous relationship exists in the atomic structure of a germanium crystal. As shown in Fig. 1, each outer orbit electron is associated with an outer orbit electron of an adjacent atom. Since no outer orbit electron is without a mate, the atoms (like the tiles) fit together perfectly. The chemist describes this situation by saying that all of the valence bonds are satisfied. As is common practice, only the outer orbit or valence electrons are shown in the drawing of Fig. 1 shown below. Consider now the consequence of replacing one of the tiles of Fig. 1 with a tile having a different number of sides. It is immediately apparent that such a tile will not fit. Either it will, overlap adjacent tiles or will leave empty spaces. These structural defects have analogies in the transistor. If one of the atoms of Fig. 1 is replaced with an atom having either too many or too few outer orbit electrons, this impurity atom will not properly fit into the structure of the crystal. Either there will be an overlap (extra electron) or an empty spot (hole) in the structure, depending upon the number of valence electrons in the impurity atom. Under these conditions, all of the outer orbit electrons do not have mates. In the language of the chemist, all of the valence bonds are not satisfied. In transistor physics, such structural imperfections are known as lattice defects and are intentionally created by introducing impurity atoms into the semiconductor material. By definition, an impurity atom is one having either more or less valence electrons than the atoms of the semiconductor to which it is added. When the chemical impurity added to a semiconductor material has fewer valence electrons than the atoms of the semiconductor, the impurity is known as an acceptor. For example, boron is an acceptor when added to germanium because it has only three outer orbit electrons as compared to four for germanium. As a consequence, each boron atom will rob or accept a valence electron from an atom of germanium. The site formerly occupied by the stolen electron is known as a hole. Because it is the consequence of a missing electron, the hole possesses the properties of a positively charged particle. This condition is shown schematically in Fig. 2. Since its atoms contain three valence electrons, boron is known as a trivalent impurity. Indium, gallium, and aluminum are also trivalent and therefore are acceptors with respect to germanium. Germanium to which acceptor impurities have been added is characterized by an abundance of holes and is therefore known as positive or p-type germanium. When the chemical impurity added to the semiconductor material has more valence electrons than the atoms of the semiconductor, the impurity is known as a donor. For example, arsenic is a donor when added to germanium because it has five outer orbit electrons as compared to four for germanium. 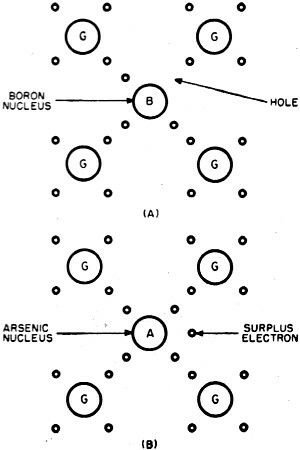 As a result, each arsenic atom provides one extra electron which is not in valence bond and therefore free to act as a current carrier. This condition is shown schematically in Fig. 2. Since its atoms contain five valence electrons, arsenic is known as a pentavalent impurity. Germanium, to which donor impurities have been added, is characterized by an abundance of electrons and is therefore known as negative or n-type germanium. Since its atoms contain four valence electrons, germanium is known as a tetravalent element. When the germanium is pure or when it contains equal amounts of donor and acceptor impurities, it is referred to as intrinsic germanium. A junction diode is made up of n-type and p-type germanium as shown in Fig. 3. When the negative terminal of a battery is connected to the n-type (electron-rich) layer of the junction, and the positive terminal is connected to the p-type (hole-rich) layer, the diode is biased in the forward direction. Under these conditions, the electrons in the n-type layer are repelled by the negative terminal of the battery and move toward the junction. At the same time, the holes in the p-type layer are repelled by the positive terminal of the battery and also move toward the junction. At the junction, the electrons and the holes effectively neutralize each other and permit current flow. This represents the low resistance direction of the junction diode. When the polarity of the battery is reversed, the electrons in the n-type layer and the holes in the p-type layer move away from the junction. Very little current can now flow across the junction because there are few current carriers in this region. This is referred to as reverse bias and represents the high resistance direction of the junction diode. The junction transistor consists of two back-to-back junction diodes with the center layer (known as the base) participating in both junctions. The input junction (emitter and base) is biased in the forward direction, and the output junction (collector and base) is biased in the reverse direction. The transistor shown in Fig. 3C consists of a layer of p-type germanium between two layers of n-type germanium. This is known as an n-p-n transistor. 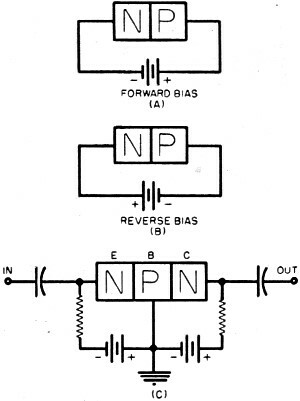 An opposite arrangement is used in the p-n-p transistor and the battery polarities must be opposite those shown in Fig. 3C. Fig. 3. The base-collector junction of the transistor is biased in the reverse direction, but current flow is increased by the presence of carriers injected by emitter. Input current therefore controls output current. Fig. 4. Resistor R determines the magnitude of the d.c. bias current. The input signal swings this current around the operating point, causing related variations in output current. In some respects, the emitter of a transistor is comparable to the cathode of a vacuum tube since both emit or inject the current carriers. In the transistor, the injected carriers may be either electrons or holes. In the operation of an n-p-n transistor, a negative potential is applied to the emitter and electrons are repelled from emitter to base. The emitter has thus injected carriers into the base region. The emitter of a p-n-p transistor is made positive with respect to base. Each electron attracted towards the positive terminal of the battery leaves a hole at its former location. The hole then captures an electron from an adjacent atom, creating another hole farther back toward the base. In effect, the emitter has injected holes into the base region. The collector-base junction is biased in the reverse direction and the current flow is therefore relatively small. This current, however, is increased by the presence of the additional carriers injected by the emitter. When an input signal is applied to the transistor, it varies the number of carriers injected into the base region and therefore varies the collector current. The ratio of the change of collector current to the change of emitter current (with collector voltage held constant) is known as the alpha of the transistor. Since it specifies the ratio of the output to input current, alpha is the current gain of the transistor. Alpha is defined with respect to the common base circuit, a configuration in which the base is common to both the input arid the output circuit. The alpha of a junction transistor is less than unity because some of the carriers injected by the emitter are neutralized in the base region and therefore do not reach the collector. For example, some of the electrons injected by the emitter of an n-p-n transistor are neutralized in the hole-rich base region. In the p-n-p transistor, the injected carriers are holes, and some of them are neutralized in the electron-rich base. It is for this reason that the output current is less than the input current. The alpha of junction transistors commercially available is in the range of 0.80 to 0.99. The higher values of alpha (approaching unity) are obtained when the base layer of the transistor is made very thin. The injected carriers then pass through the base in less time and fewer of them are neutralized. Because the alpha of a transistor is less than one does not mean that it is incapable of producing voltage gain. The feature of the transistor that makes voltage gain possible is the high output resistance as compared to the input resistance. Even though the output current is slightly less than the input current, it flows through a higher value of resistance and therefore produces a signal voltage of greater magnitude than that of the input signal. For the same reason, the transistor is capable of power gain. When a transistor is connected in a common emitter circuit, the input signal is applied to the base and the output is taken from the collector. With this configuration, a current gain greater than unity can be achieved. This base-to-collector current gain is known as beta, and values of 30 to 40 are common for commercially available transistors, The beta of a transistor is related to its alpha as follows: beta = alpha/(1 - alpha). From this relationship, it is apparent that the beta of a transistor becomes greater as its alpha approaches unity. The vacuum tube is a voltage-operated device and bias voltage is used to establish the desired operating point. The input signal then swings the grid around this operating point, The transistor, however, is a current-operated device. A steady d. c. bias current is used to establish the initial condition and the input signal then swings this current around the operating point. In the common emitter circuit, the input signal is applied to the base of the transistor, The steady bias current, upon which the signal current is superimposed, is known as the base bias current. In the common emitter circuit shown in Fig. 4A, battery B1 supplies the base bias current, and battery B2 is used to bias the collector circuit. Fig. 4B is a circuit arrangement which uses a single battery for biasing both input and output circuits. Resistor R determines the magnitude of the base bias current and therefore establishes the operating point. 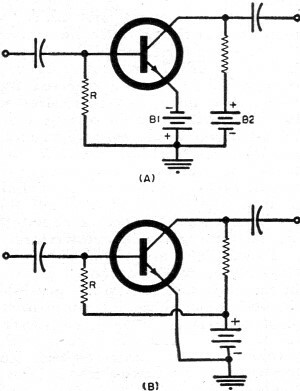 The collector of a transistor is biased in the reverse (high-resistance) direction. Consequently, current in the collector circuit is relatively small. This current, however, is increased by the presence of injected carriers and therefore varies in accordance with the variations of input signal. Even with the input current reduced to zero, some small amount of current will flow in the collector circuit. This is known as collector current cut-off. It is not a true cut-off condition such as can be obtained in a vacuum tube because the collector draws some current even with reverse bias and with no injected carriers. The current, however, is sufficiently small to justify the use of the term cut-off. The amount of power that can be dissipated in the collector of a transistor is limited by the possibility of damage or serious change of characteristics as a result of overheating. Except for specially designed power transistors, collector dissipation is usually in the range of 50 to 150 milliwatts. Numerically, collector dissipation is equal to the product of collector current and collector voltage. The transistor must be so operated that this product does not exceed the maximum dissipation rating. For example, if the maximum collector dissipation of a transistor is 100 milliwatts and the collector voltage is 25, the collector current must not exceed 4 ma. If the collector voltage is reduced to 20 volts, the permissible collector current will be 5 ma. Naturally, the operating range of the transistor should be so limited that at no point will the rated maximums of collector voltage and collector current be exceeded.